This week’s pick is Afterlight…although I’m not really talking about the base app, but isn’t actually the app per se, but its excellent extension. Afterlight fulfills the promise of iOS 8 for me: the ability to use the Photos app for photo management, viewing, and editing. I like using Afterlight much more than loading up dedicated editing apps like VSCOcam, which involves importing pictures from my Moments, making the edits, and then saving those changes as entirely new pictures back to my photo library. This results in a lot of duplicate photos, and since iOS doesn’t show file names in the Photos app, it can be hard to tell which shots I want to delete after I’ve edited a large batch (and created a large number of duplicates). 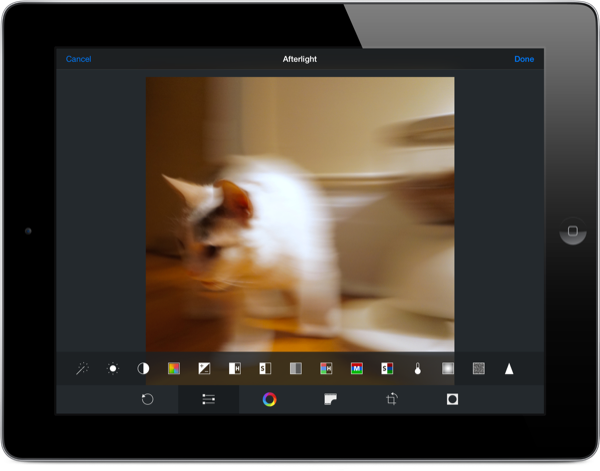 Afterlight’s extension lets me edit photos from within the Photos app, and without creating any duplicates — and that’s really game changing for me. The standard features like exposure, brightness, and contrast are present in Afterlight’s extension. But that’s nothing special because those are already present in the standard editing suite built into the Photos app. What’s more impressive is the inclusion of effects like Sharpen, Vignette, Shadow Tones, frames, and filters. Afterlight brings the kitchen sink when it comes to editing tools, and I’m amazed they managed to fit this many into an app extension. The only area that’s disappointing is the set of filters. I’ve tried a few of the filters out over the past few weeks, and they just seem to overlay a single colour over my pictures. Here’s an App Store link for Afterlight; it’s a $0.99 app and a universal app designed to run on iPad and iPhone.